Ali studied Leisure and Recreational management in college with a specialty in outdoor activity leadership and has been teaching for over 15 years. Born and raised in England, She moved to the U.S. in 2006, settling in Big Bear, CA. 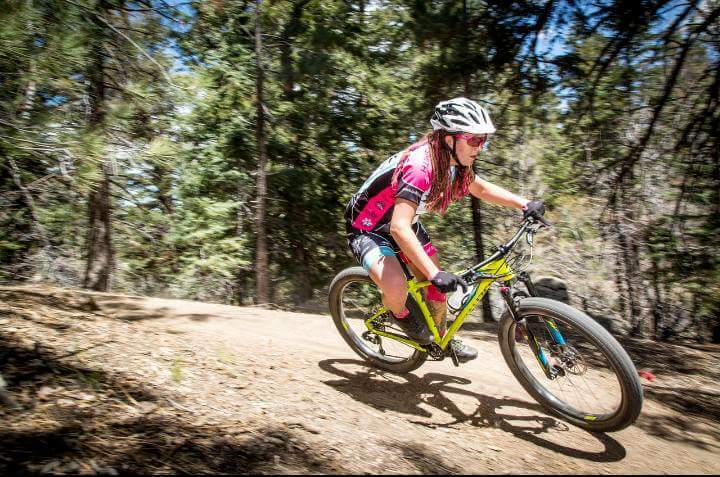 After finding a job managing her local bike shop; Bear Valley Bikes, she quickly became obsessed with all types of cycling. She began racing XC and XC endurance but quickly branched off into enduro and downhill, but has most recently been back to racing XC on a single speed! 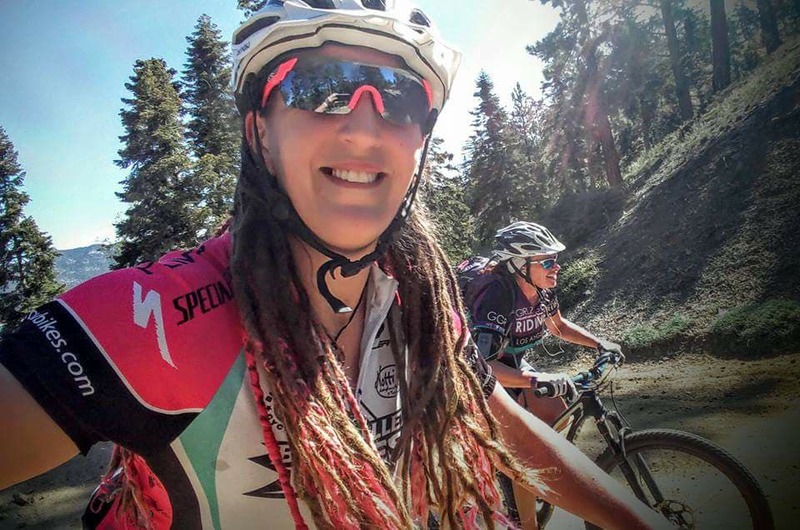 Also passionate about road cycling, she can often be seen towing her kids in long distance events, or solo on rides like the Peak 2 Peak from Mammoth to Big Bear or the Breathless Agony Century. Her passion for teaching, patience as a mom of 3 and ‘Shop Mom’, make her an ideal ride leader for Girlz Gone Riding. Her enthusiasm for education and community in women’s cycling is both undeniable and contagious and as Director of the GGR chapter in Big Bear, she strives to support the women’s community and to continue to ‘Spread the Love’ of cycling! I actually first started riding road bikes back when I worked in a gym and wanted to do triathlons. Even though I'm seen as 'a mountain biker,’ I still have a secret passion for road cycling! I then took a course in MTB leadership at a summer camp I worked at, but it was still just another sport to teach. 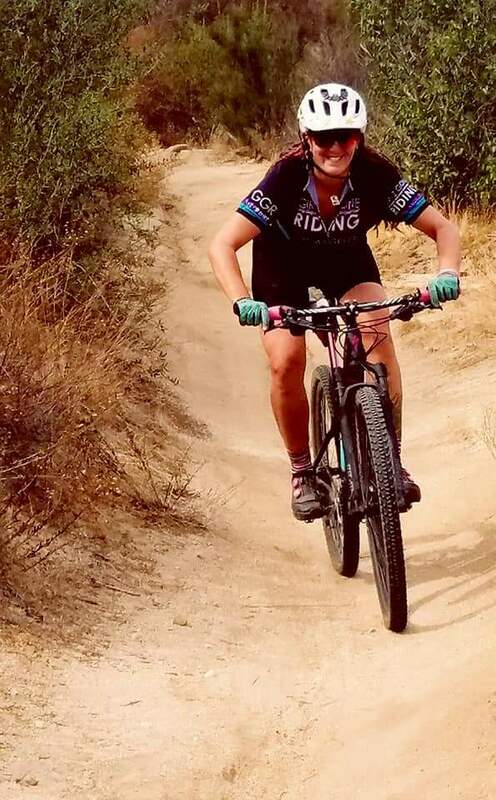 I really got bitten by the mountain biking bug when I started working at Bear Valley Bikes, and I think that has had an influence towards all aspects of cycling in my life including racing, group rides, and inspiring me to 'spread the love' of cycling. When I really started getting into mountain biking, all my crashes were when I was going uphill! I was determined to make it and would stall out and fall off the singletrack! I was fascinated by the skills involved and watching other people clean things, up and down, that just didn't seem possible. I quickly became obsessed with conquering the challenges I faced and fell in love with the social and community aspect of riding. What is your favorite race/event to attend and why? My favorite event would have to be the Girlz Gone Riding Big Bear women's weekend. It's amazing to see so many women come together in my town, meet new people, reconnect with friends, show people the trails and dedicate an entire weekend to mountain biking! My favorite race is probably the 12 hours of Temecula. Each time I participate, I feel like I'm stronger and faster, yet every time it is still a challenge, with different courses and different teammates keeping it fun and interesting every time! Do you have tips or suggestions for someone attending their first mountain bike race? For me, racing is not just about the race. Everyone is there to socialize and have fun, so just relax and go with it. Take your bike to your local shop before the race, and get it checked over and race ready; there's nothing worse than arriving at a race and realizing you have a mechanical issue! In my experience, everyone is very supportive, especially of first-timers. You enjoy a couple different styles of mountain biking, for those who may not know that there are "different types" of mountain biking, can you elaborate on which styles you enjoy and why? Oh my, where do I start?! I will try to keep it simple. Cross country is where the challenges are in both the climbs and the downhill, 50/50. I love XC because the climbing is difficult for me, but the DH is easier, so I can relax and go really fast without any stress! I like to make it even more challenging by riding my hardtail (no rear suspension), single speed (only one gear). Enduro is where you still climb but you are only timed in the downhill. The downhill is more technical, but still requires pedaling. I enjoy enduro because the downhill is more technical, and I like to push myself to pedal hard every chance I get. Usually, at enduro races, everyone hangs out together at the top, and I love the social aspect of sharing that experience together. 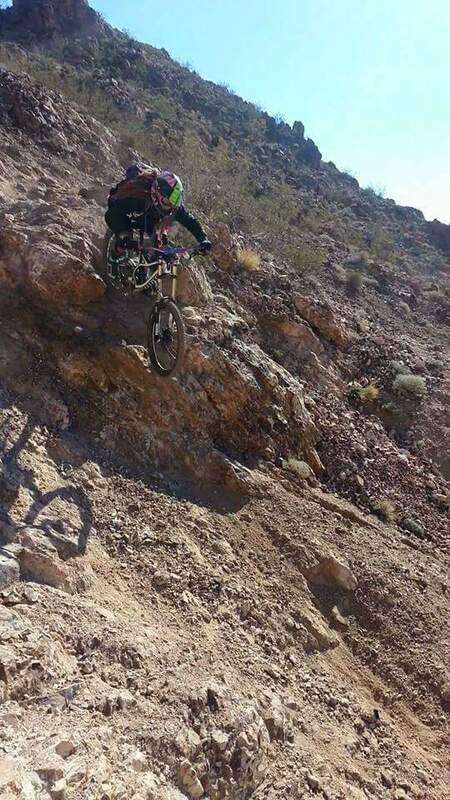 Downhill is just what it sounds like. You are focused purely on the downhill side of riding. Usually, the bikes have 'bigger' suspension to handle chunkier, more technical terrain. There can be more 'natural' features that are steep, loose and chunky, but then bike parks also build man-made features like jumps, berms, and walls. These features keep the course interesting with ever-changing fun things to try. You either hike, shuttle or take a lift to the top because the bikes are not designed to go up. Downhill is a real adrenaline rush for me, and I love trying things that scare the crap out of me and the achievement I feel when I overcome them. Again, I love the social aspect of being on the lift or on the shuttle with friends, and everyone stops and 'sessions' the hard stuff together. I like clips for road, XC, and enduro because I believe they are more efficient when I pedal, and I feel like I can use them to help control the bike. I prefer flats when I ride DH so I can ditch out more easily on the scary stuff; although, I had to adjust to flats and my feet not coming off the pedals when I jump! I love how sticky flats feel nowadays when combined with the right shoe. I don't like flats when they 'bite' me though! My worst/most consequential crash was probably a few years ago on my birthday. Many factors led to me face planting off a decent sized drop. I snapped my clavicle and tore my labral cup (the socket that holds your shoulder in place). I then hiked out because I didn't want to be airlifted on my birthday! Riding bikes are therapeutic to me, so I had to deal with not having that and being off the bike for a while. I felt like the medical system failed me. Healing was slow and I re-broke my clavicle twice. I needed surgery, but it never has happened. I had to re-learn to ride because my arm doesn't work or move like it used to. I feel like this made me a better rider though because I had to learn to lean the bike more when I cornered, and become more aware of what my whole body is doing to control the bike. I didn't want to race because I felt slow and clumsy, and the risk of further injury was high if I crashed. I felt like if I couldn't go full throttle, what was the point? This caused me to reevaluate my focus on riding. I gravitated back towards teaching and mentoring. 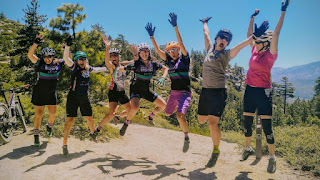 I coached my 70-year-old, beginner friend through a race series and eventually formed the Girlz Gone Riding Big Bear chapter. I still love to race but now I love coaching my kids and organizing fun group rides and events. Before my crash, I was pretty focused on self-improvement in my riding, but now so many more aspects of riding have opened up for me. I care less about riding as fast as possible over the most challenging terrain, and more about just riding, whatever the pace or skill level. When I first started mountain biking all of my 'crashes' were when I was climbing! I was so determined, I would refuse to unclip, and then I wouldn't have the strength to get up something steep or technical, and I would topple over. I quickly learned to fall into the slope, not downhill! I think I still struggle with technical climbs, but now it's more of a head game. It's easier to get up that rock or root when you're a little stronger and you're not spinning a super easy gear. Getting hurt was a huge set back in my riding. I had to relearn to steer the bike because my arm wouldn't work the same as it had before, and everything was a challenge like when I first started out. I just figure if I keep trying, I will get better every ride, and if I don’t, then so what? I'm having fun and enjoy riding, regardless. For so long, I couldn’t ride, so I figure whatever I'm doing now, it's better than not at all. Everything. There's something indescribable about riding a bike and the way it makes you feel. I love solo rides, but I also love the social aspect. I love that I feel like I found my tribe. My XC bike is the Specialized Era 29. I like the Era because it has the brain technology which automatically locks out your front and rear shock when you don't need them. The suspension is super stiff when climbing but I enjoy that I don’t have to remember to adjust it for undulating or downhill terrain. For enduro riding, I have a Specialized Stumpjumper 650b. I love the bigger suspension and smaller wheel size for the downhill, but the bike is still very responsive and capable in the uphill. I also ride a Specialized Crave 29 single speed. I like the single speed because it gives me another kind of challenge in my riding, and it's a really good workout! I first met Wendy several years ago when she emailed our shop looking for a tour guide for her and a few friends who were planning a trip to Big Bear. The following year, she reconnected with me and asked if I would show her some trails. She introduced me to GGR and I was happy to help out. After that, I became good friends with Wendy, becoming more and more involved with the club, and the Big Bear GGR women's weekend grew each year. I think starting the Big Bear chapter was a natural progression. In working at the shop, I meet a lot of women who are looking for people to ride with or a group ride because they don't know the local trails. After my crash, I was hurt and recovering, and I think I needed Wendy and GGR in my life as much as there was a need for a Big Bear chapter! Wendy is so inspirational and has been so supportive as a friend and as head director of the club. 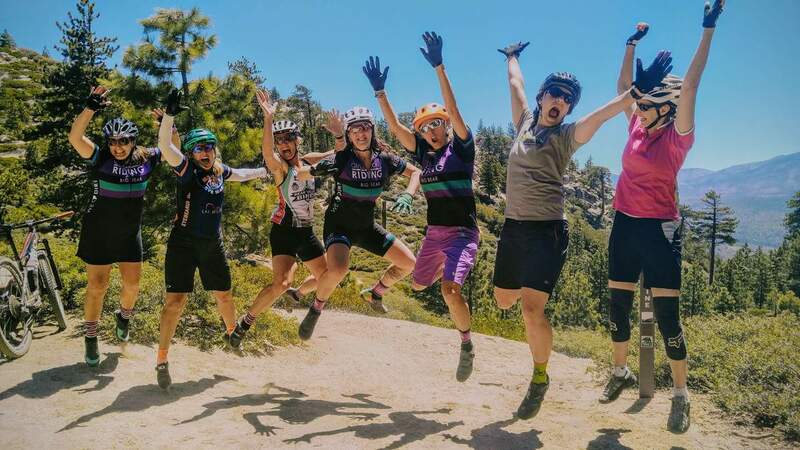 Why do you feel women's groups like Girlz Gone Riding are important? I think that riding with other women has a different dynamic than a coed ride or riding with your partner. I love both kinds of group rides and am happy to provide a different experience of riding for women. I feel like sometimes it can be difficult for women to learn and grow their skills riding with a coed group or their partner, and we provide a support system more conducive to individualized learning. Men and women learn differently, and I feel GGR is a great opportunity for women to meet others who understand each other and can share difficulties they may be facing. It’s also just wonderful to have a community in which to have fun and build great friendships. I've always loved the relationships I’ve created in riding, and I believe building a strong women's community can only be a good thing! For someone who might be nervous about attending a group ride, do you have any tips or suggestions that may be helpful? There is nothing to be nervous about! People attending the ride are there because they want to ride with others, and all are welcome. People are encouraged to contact us beforehand with any questions or concerns if that makes them feel more comfortable, and we also host social events so that you can come and meet some of the rest of the group and connect before attending a ride. When offered the job part-time at Bear Valley Bikes, I honestly drew up a list of pros and cons. In the end, it probably came down to the fact that I had taken apart my 1983 road bike when I moved here, and I needed help putting it back together! Before I knew it, I was working there full time and become obsessed with cycling. The shop became like my baby, and I have worked tenaciously to improve and grow the business, which has actually become two businesses with the launch of Speed Evolution, plus an event that we host, The Big Bear Grizzly and Gran Fondo. I love working alongside people who share my passion for cycling, and helping customers find the perfect bike, part, accessory, trail, or getting their bike working again. I love the people that I meet and the fact that I get to spend a lot of time talking about bikes and bike riding. What has been a challenge you've had to overcome (if any) as a woman working in a bike shop? Most people are appreciative to have a woman helping them in sales and are open-minded, but you do sometimes get a customer who 'wants to talk to one of the guys,’ or just presumes you don't know anything about bicycles because of your gender. This can be frustrating, especially when you know more about the particular subject than the guys who are working! I just try and be polite and give good customer service, and think I have pleasantly surprised some people. As for the others, I know my coworkers are capable of helping them, and they just missed out on my knowledge, and that's their loss. Why do you feel it's important for women to be involved in the cycling industry and have jobs in bike shops? I think women approach things differently than men, and that having both men and women creates a dynamic working environment. I feel that with the women's side of the industry growing so much it is important to have female employees who can give a first-hand experience of the products available. Any tips or suggestions for women looking to seek employment at a bike shop? If you are passionate about cycling and want to work in the industry, go and apply and show that you are just as knowledgeable and skilled as any other candidate, male or female. What do you feel deters women from getting involved with cycling? Especially in mountain biking? I think all the different bikes and gear can be overwhelming, and mountain biking especially can be difficult and seem scary when starting out without anyone to guide and teach you the basics. I think the industry is already changing to appeal more to women. Advertising has become less sexist and manufacturers seem increasingly aware of women’s needs, and it just needs to continue to evolve in this area. I think locally, having women’s cycling clubs and women’s only clinics and rides can help people feel more comfortable getting involved in cycling. I love to help anybody get into cycling, meet others, and enjoy the sport more, be it, men or women. If I could introduce someone else to the sport I love or help them improve in their riding, then that makes me happy. But I feel that as a woman in the industry, I should be sharing my knowledge and experience with other women, as other women did for me when I first started out. I am inspired by many of women I have met over the years who work hard to share their passion for the sport. I used to live in a van and traveled around Europe in it! Ali I really enjoyed the interview home girl...great questions Josie! I think I am that 70 year old friend that Ali coached through my first race. She also spent a lot time prior to the race to help get me familiar with the track and to help me believe I could do it. So patient and positive and funny. On one of our trial runs it hailed and we laughed. I had to move away from Big Bear Lake and Bear Valley Bikes and I can't seem to ride anymore without her and all my other Bear Valley Bike girlfriends. I don't think Ali and friends realize how special they are. How inclusive how passionate... I was the most terrified of all bikers but I really wanted to ride with the ladies in Big Bear. So I kept trying always receiving the most encouraging words from all. Ali wants everyone to ride and will do whatever she can to help. There is nothing like that here in Jackson Hole but I took my bike out yesterday missing my Big Bear, Bear Valley Bike friends.. I didn't know how to ride a bike.. I walked into Bear Valley Bikes and announced that I wanted to join the team. Instead of everyone laughing at this 69 year old lady... they applauded and received me with warm welcoming arms. Ali even sold me her beloved carbon Trek mountain bike. I miss her so much. She is such an awesome coach, friend, rider, shop manager and I could go on and on. I asked her once. "When will it stop being so scary/" her reply was "Never".